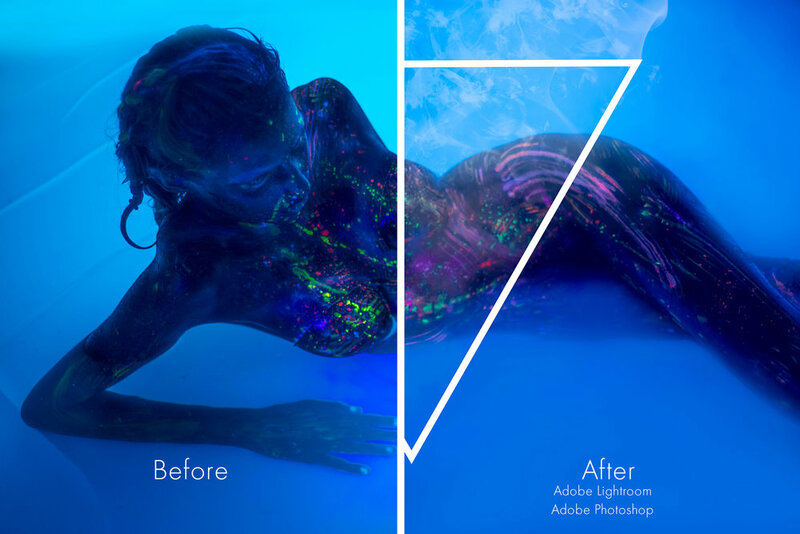 The process behind Neon UV Photography. I started creating neon UV photography in college during my photo 1 class. From my personal opinion, I was bored of seeing the same work over and over again during early morning critiques. During our final, my professor said: "You can create anything you want". It was the moment that I was waiting for. I went home started to immediately brainstorm concepts. The one thing I noticed during critiques was that the walls were always the same colors, black, white, gray, etc. I wanted your eye to draw towards my work. I didn't know at the time, but when you create UV photography it's challenging. Obviously, trying anything for the first time you're facing an uphill battle. When I would take pictures of the model, I couldn't see her, literally. I had to guess and focus the lens on an estimation. As I practiced more and more, I purchased a UV black light flashlight for like $10. Best $10 I ever spent. This tiny flashlight lets me actually focus on her personally so the lens could focus on the subject. The "Before & After" are the before shots with absolutely zero editing and what happens when I applied Adobe Lightroom and Adobe Photoshop. It took me hours to edit the piece to become the flawless image you see in front of you. One issue I had originally was that the ISO was so high (around ISO 2600, I believe). When your ISO is that high the "noise" is everywhere. It almost looks like tiny particles all over the screen. The issue with noise is whenever you do any editing to the original piece it's completely noticeable from rough to smooth, it didn't look natural; it drove me up the wall. After doing further research, I figured how to remove the noise (Reduce Noise and Surface Blur) all tools you can find in Adobe Creative Cloud Suite. 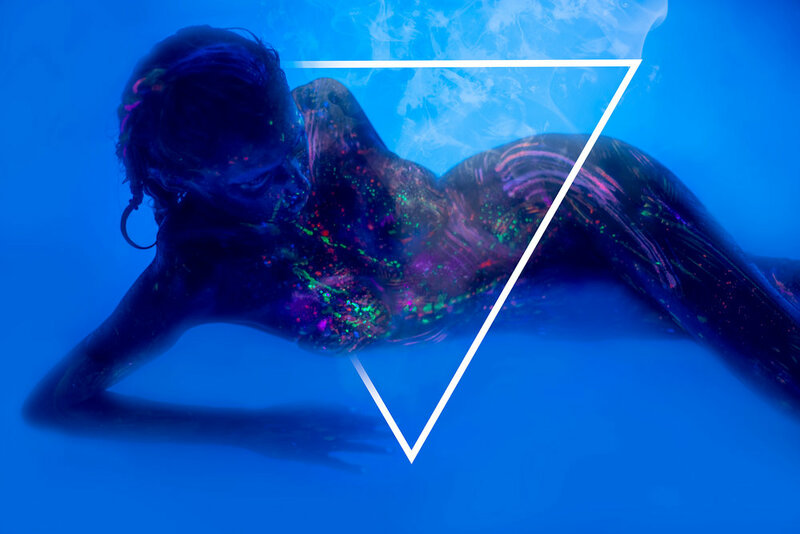 Neon UV photography is still uncharted territory and I have much more to learn but, I hope you continue this journey with me and enjoy my work. Tools used: Adobe Creative Cloud, MacBook Pro, iPad Pro, Apple Pencil, Astropad, and Nikon.